This utility updates the RMN-U1 software to version 1.00.303, and adds the capability to control the Slacker® Personal Radio Streaming Service on the NAS-SV20i and NAC-SV10i network audio devices. IMPORTANT: Do not power off the unit or remove the unit from the remote control charger while the update is in progress. If you have an NAS-SV20i or NAC-SV10i Network Audio Device, you also must update the Network Audio Device firmware to version 1.02.200 or higher. To perform this update, the RMN-U1 must be connected to the Internet via your wireless network. Place the RMN-U1 on the remote control charger. On the Network Remote Controller, press the "HOME" button. At the Home screen, tap "Settings". At the Settings screen, tap "System Update". 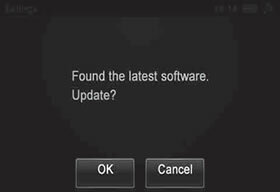 When the "Found latest software Update?" message appears, tap "OK". Note: The update process may take up to 20 minutes to complete depending on your network communications environment. The unit will automatically restart when the system update is complete.